Behind the scenes - Interior. Thought I would post a BTS image from a recent commercial shoot, along with a short write-up on the processes involved. 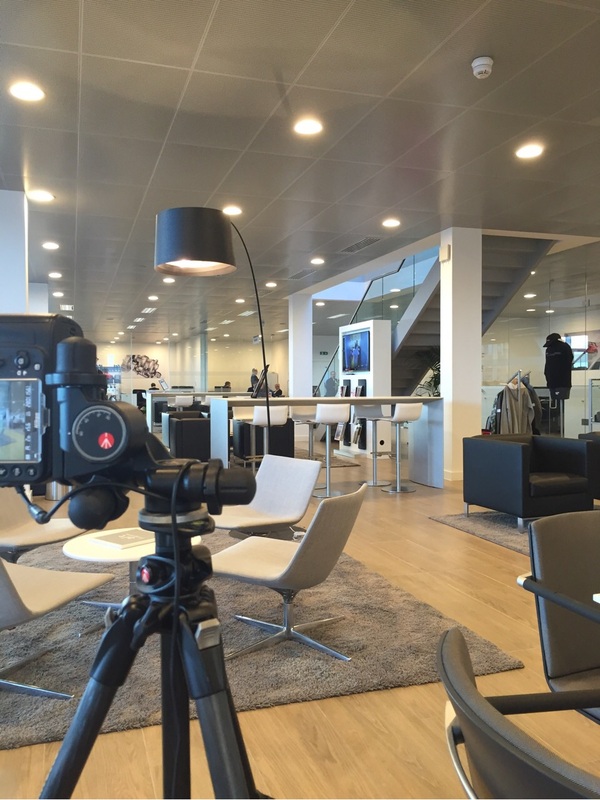 The image shows the interior of the premises and my camera in the middle of being set-up for the shot I was after. Taking 'Interior' photographs is not always as simple as one might think. There are always a range of technical difficulties to overcome, and simply having a tripod and a wide angle lens is often not enough. All these things and more have to be considered when talking the images, and setting-up for your shot. My approach to photographing interior spaces has evolved over time and experience, and also depends on the remit and client requirements for the images. There is obviously a difference between shooting a home with individual rooms, and shooting a large open plan commercial space. Sometimes utilising small flash units to bring light to shadow areas, or draw attention to features and to balance with the ambient light can be the way to go. Alternatively, it is not always possible to have flash units in the shot so, compositing the shot from multiple images each with individual areas lit and then combined in editing to produce a final image can be used as a method, although it is more time consuming. Having flags, reflectors, and flashes available is always advisable, along with clamps, clips, cards, and tape in order to be able to adjust the ambient and added-in lighting to your ideal. After I have the RAW images, then they are uploaded and first processed in Adobe Lightroom, having perspective and parallax correction applied as well, and then if more detailed work is required I move them into Photoshop for further editing and correction. Using quality software and colour balanced monitors helps maintain the image quality throughout and ensures that the image seen on the screen and in your mind is the one that the client receives. This is just a short step-through of part of the work conducted, so you can see what kind of process goes into making a high quality interior photograph. Again, if you have any requirement for commercial, architectural or interiors photography and would like to discuss or ask any questions then please get in touch.